Question: What does a librarian do? Ok, my personal answer is at the end of this post. First, in typical librarian fashion, let me refer you to information that's already available out there. A colleague recommended this webpage, which I found to be quite good if you want a detailed overview (er... did I just use an oxymoron here? Anyway, you'll see what I mean). The information is by the U.S. Department of Labour. Most librarian positions incorporate three aspects of library work: User services, technical services, and administrative services. Though it's focused on the U.S. context, that section on "Nature of the work" is general enough to represent most librarian-related jobs, covering a wide range of specialisations -- public libraries, academic, government/ institutional etc. You can probably skip the rest of the webpage as the rest of the information is very U.S. specific. Your responsibilities include acquisitions and cataloguing of materials, indexing of newspapers and journal articles. In addition to promoting the library collection and services, you will assist users to identify the relevant sources of information and conduct user education programmes. You will also assist in the development and administration of library IT applications. I'd say what's listed there is quite typical of the job scope in academic/ university libraries. You can also generalise it for research and privately run corporate libraries. Of course you don't necessarily do all of the tasks (e.g. not everyone supervises staff). But you'd probably do most of it if you've been at the job after a certain time. It's really a matter of degrees. Unfortunately I didn't have time to do a more throughout search for library job postings for other institutions like NTU and SMU. You might want to email your enquiry to AdultServices@nlb.gov.sg ask@nlb.gov.sg. They'd really save you time (I'm not just saying this because I'm responsible for that service. If you're not satisfied with our service, email me). My personal take of what a librarian does: If you've bothered to read thus far, chances are you might find some of the earlier terms unfamiliar and generalised, or too job-specific. So here's my version in hopefully more familiar terms. There's probably a few more to add, so feel free to comment. One reason for this blog is to give non-librarians an insight into what a public librarian might do. Of course I am NOT the only public service librarian around; what I do is NOT the definitive Public Librarian job scope; I do NOT blog everything about what I do as a public service librarian. Truth be told, I'm more in a management position (but hey, management and librarianship are not mutually exclusive). They give the perfunctory "Oh, that's nice" response, but they really don't have a clue what the heck is it that you do, except that you work at "The Library". So I thought blogging a little of what I do (i.e. show-and-tell blog-style) might be a more effective way, especially when people tend to Google nowadays. There was a chance of people doing a google search, picking up a (Singapore) librarian's blog, and learning more about the things ONE particular librarian does. What I did not expect was people contacting me to ask about careers in librarianship. It's a bonus of sorts. I think one would have to first understand a bit about what a librarian does, before one got interested in being a librarian. So I'd hazard a guess that I've met one of my initial objective in a small sort of way. Of course I don't get tons of enquiries about being a librarian. To date, I think I've got 3 or 4 emails asking me what a librarian does (and at least 2 of them were interested in applying to NLB to be one). And recently, these comments posted here. Maybe I should start getting an exact count. I've heard librarians say that Librarianship is not respected as a profession. I don't profess to have answers to resolve that image problem. But I know first-hand that blogging about what we do is one way to connect with our customers and potential colleagues to the profession. Was surfing around for ideas and references for an article I'm writing (for an upcoming internal publication -- you'll hear about it later). Discovered that Asimov's Science Fiction website features SciFi-related blogs. There's also a whole bunch of SciFi author blogs, here. If any of you know of more SciFi blogs, feel free to post here. I'm also interested in Fantasy/ SciFi+Fantasy related blogs & author blogs. What else have I taken for granted lately? I started this list a while ago, not really to explain to others why i was blogging, but more for myself to understand, why the hell i was blogging. What does it had to do in my life, why it caught my attention and why it quickly became an habit - even skipping a day or two could make me feel that something was missing. Unlike Marie, I don't feel that I have to blog daily. I don't. But at times I would ask myself if it was worthwhile maintaining this blog, since I only blog outside work hours and blogging does take up my personal time. So it was nice to be reminded by Marie of why I, too, blogged (which was to let people know more about what a public librarian does and to publicise the library service) and why I've continued (because I'm getting some positive results, judging from the emails and comments received to date). And then there's also the part about self-expression. Plus the friends and librarians met as a result of the blog. Things that I've taken for granted. Thinking about that led me to think about libraries and books. At any one time I have at least 5 books borrowed from the library, sitting on my bookshelf. Ever since I started working for the library, I've found fewer reasons to buy books when I could borrow most of what I want. It would be unthinkable if there were no public libraries. Can something like that happen? It's pretty remote at the moment, but who's to say? I'm not taking things for granted. I tried to think of some elegant answers to impress the readers of this blog, but in the end my most honest and simple answer was, "To serve the library customers well". Simply mind-boggling and almost leading to a self-induced depression and catharsis. What will I do about it? Can I do anything? Heck, I figured I'd just do the one thing I can do, right there and then -- I went over to my wife and squeezed her hand a little harder. She asked why I did that. I said it's because I read a blog post by someone called Marie. She gave me a funny look. I gave her a longer answer (see the above). I got approving nods in silence. National Library Board, Singapore is organising a 2-day Conference on 14-15 November 2005 in conjunction with the official opening of the new National Library at Victoria Street, Singapore. This Conference will provide a platform for information and knowledge professionals, librarians, academics and consultants to exchange views and ideas on the future and the impact of new digital technology on the library and learning. As a prelude, a Welcome Gala Dinner will be held on 13 November 2005 to promote networking opportunities. You can download the programme sheet and check out the speakers, here. I just learnt a new word (or concept) minutes ago: Produser. "Producer + User", where users become "active producers of content in a variety of open and collaborative environments". This is what I gathered from reading this post about an upcoming lecture (Sept 28) by Dr. Axel Bruns. He will be lecturing on grassroots participation in "open" online environment and also conducting a workshop on the notion of the "produser". Unfortunately (for me), Dr. Bruns isn't in Singapore. He's lecturing at SUNY Buffalo, New York. But fortunately, thanks to technology, Kevin would try to record that event for me (is he a swell guy or what?). We were just exchanging a few lines over Instant Messaging (did I say technology was great?) and he said he'll try. I won't hold it against him if he doesn't have time to record it. I'm confident someone who attends the session will blog about it. 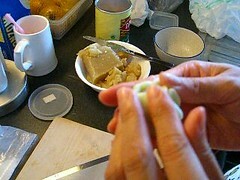 I watched my wife make a batch of mooncakes this afternoon -- the 冰皮 ("Bing Pi") type -- literally "Ice Skin" or "Snowy Skin". Decided to blog it for future reference (and also as an example of blogs as learning tools). Click here to check for item availability. 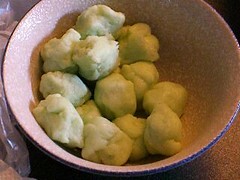 The dough -- The 冰皮 is made from fried glutinous rice flour, icing sugar, shortening, pandan essence, and water. No baking required for this type of skin. 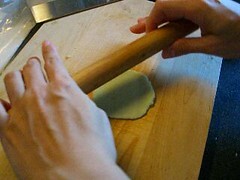 Divide the mixed dough into equal portions. Tip from my wife: Don't make too much unless you intend to use them all. Leaving the excess dough in the fridge tends to dry them out. The fillings -- you don't have to make this from scratch. 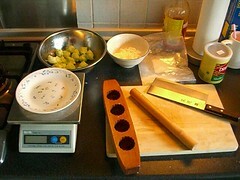 My wife used ready-made fillings. 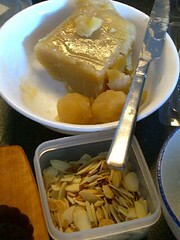 She divided them into equal portions and for this batch, she added almonds. The Mid-Autumn Festival, which falls on the 15th day of the eighth lunar month, is also known as the Mooncake or Lantern Festival. Round 'moon' cakes with a variety of sweet and savoury fillings appear in shops, and paper lanterns of all colours, shapes and sizes are also sold. Several interesting legends are connected with this festival but, basically, the mooncakes signify unity and a cycle completed - traditionally, the end of the farming year and an abundant harvest. Some references to the legends associated with mooncakes here, here and here. 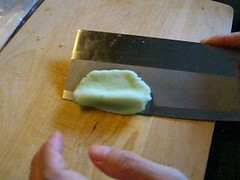 ... and place the whole thing into the mold. 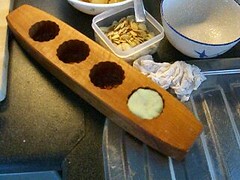 My wife swears by wooden molds. There are different patterns to the molds. Nowadays, there are even designs with Japanese Manga characters. 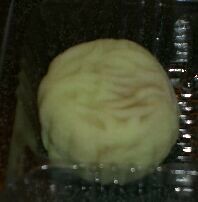 A mooncake is born! There you have it. My wife packages some of them to give away to the neighbour and friends. 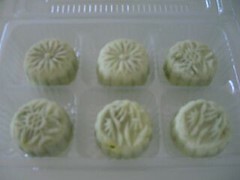 They are called 月饼 in Mandarin (月= "Moon"; 饼 = "Biscuit" or "Chinese cake"). You're supposed to eat them while gazing at the moon. One of these nights, my wife and I (with our dog) just might go downstairs to the common garden area of our HDB apartment block, with a flask of tea, a tealight (in lieu of a lantern), a box of homemade mooncakes, and gaze at the moon -- or pretend to, if it's a cloudy night. Wish my mother would post something like this! Ooo... Sarah (of The September Project) got her mom to post an entry in TSP blog! How cool is that? Sept 11, 2005 IM chat: "Changing the World, One Friend at a Time"
Julian and Sarah beat me to the post. Julian even posted a transcript of the session. Session started at 2pm (Singapore time). The session was scheduled for 1 hour but extended by 40mins because of the lively discussion. We called the event "East Meets West" and the East did indeed meet the West (TRL in the East and JRL in the West; Singapore in the East and Sugargrove in the West). More than that, there was the meeting of minds, I think. It wasn't even about September 11, per se. Total participants = 20 to 22, excluding NLB librarians/ staff. Of the 20 or so, 4 were from USA (offsite), 1 from Philippines (offsite), 15 from Singapore (2 logged in from offsite) and 2 offsite participants (location unknown). Majority of the participants (75%) were under the age of 22 (so we had more teens!. The remaining were in the early 30s. The youngest was 11 years old, and the oldest was 45. 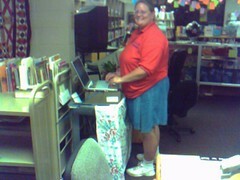 Beverly, Sugargrove PL, shares this photo of her at the laptop, IMing away. Her library stayed open at 1am on Sept 11. Difference between "Moslem" and "Muslim"
Do you think teens today have a goal in their life or just drift and get by?" I was moderator for the session and given the dynamics of the chat format, it could be tricky. I calculated that there were about 6 responses every minute, or one comment every 10 seconds. Discussions did get sidetracked and there were side conversations but overall, participants stayed on track. Moderating the IM chat was essentially the same as a face-to-face discussion, except at a faster rate. "the more we talk the more I see parallels in our lives - all these miles and cultures apart"
"Thanks for the clarifications re "muslim." we have a huge population in the philippines and there's been a lot of conflict--it's still there--but most of them live in the south, so i haven't had much contact." "i think most teens i know, have some sort of goal...but its usually quite hazy"
"Goals seem to change as one grows up"
"parents are so caught up with their own work that they dont really give us much attention"
"i think that in Sugar Grove we understand very little of what life is like away from our country"
"understanding" seems to be such a BIG word now. i've been to the US and to singapore, but i don't remember actually having discussed cultural differences. i guess i just took it for granted that i was different... and left it at that." "i think this was a great starting point for folks from singapore, philippines, india, and the US of A to meet and find out a little more about what it's like over in each other's country/culture, but maybe in future we could arrange for a more convenient time for those on the north american continent, so we don't outnumber them so badly." "maybe one friend at a time we can make the world more friendly and more like home"
"thanks for presenting this idea to the world, or at least our corner of it"
I see the event as an example of the public library's role in proactively facilitating conversations and ideas beyond geographical boundaries. When we get comfortable doing that, the promotion of books, ideas and information can take place seamlessly. The number of participants isn't important. The quality of the conversations is. The transcript has a good record of that. Kelana, Rachael, Hui Hong, Hwa Shan, Lin Li -- my colleagues who deserve ALL the credit for working on this event. Beverly Holmes, Director Sugargrove Public Library, Chicago Illinois USA -- this inter-library event wouldn't have taken place without you. Sarah & David, co-organisers of The September Project -- I'm indebted to your support thoughout. The participants -- Tracy, Alison, Vernon, Julian, Preetam, PJ, Alywin, Christopher, and those teens who didn't leave their names -- thank you for your participation. I truly, honestly think that you people are changing the world. You just don't know it yet. I sound mushy, don't I? Events like this humbles me. I realise -- again -- how small I am in the scheme of things. You don't pull such events off alone. Events like this makes me proud to be a public service librarian. Discussion point posed to the teens; they were asked to continue the opening statement: "Why do people..."
"... Have narrow views of beauty?" "They want a purpose in life." "I idolise my father. Why? He's a role model for me. He's resourceful. He's good, kind hearted. He helps me. That is why I love my father. That is why I idolise him." 9th Sept. TRL (in the east of Singapore) and JRL (in the west) hosted a total of about 80 students (15 to 16 year olds). The students were participating in the Speak Good English Movement (SGEM) event which involved a "Dramazing Race" in the morning (i.e. a race that has drama and information-seeking elements), and a "East Meets West" Digital Video-conferencing/ 'live' IM chat in the afternoon. The discussion topics were based on what we posed for the Sept 11 'live' chat with Sugargrove Public Library (Chicago, Illinois), Jurong Regional and Tampines Regional in Singapore. 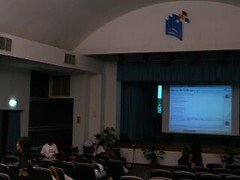 TRL Auditorium: IM chat session, with the discussion points on Language, Culture, and Lifestyle. The teens were asked to express their thoughts. Which they did. Students from one side expressed their views and participants from the other library responded (one segment was via IM chat, and the other part of the session was via Videoconferencing). 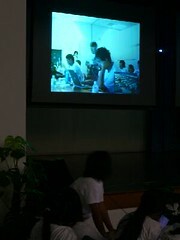 TRL: Students at TRL at the foreground, with a video-conference shot of students at JRL. I couldn't mulit-task; keeping up with listening and noting down what the teens were discussing. It didn't help that the technician on standby (I was in the sound control room) was chuckling away from time to time from the humourous remarks that some of the teens made. What's clear to me was that these teens have lots to say. My estimate was that each student spent up to one minute at least at the microphone, expressing their thoughts or providing a response to a comment from the other side. And it was their intelligent and earnest expressions that mattered. Student at TRL exchanging views with counterpart at JRL via videoconferencing. 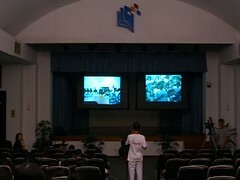 Part of the reason for trying out videoconferencing and IM for this event was to add that I.T. element to the discussion for teens. We wanted to experiment with different modes of communication with the teens, just to see what happened. Sure, we could've done a face-to-face discussion but I think it wouldn't have been as exciting (wish I could show you the video, with the teens cheering and luckily no jeering). I observed that in general, the students were more expressive verbally than over IM. Interesting... perhaps IM was closer to writing, and that required more thought that just speaking their minds. After the event, my colleagues and I did a quick round up of the day's event and we noted a few major points we had to tighten up regarding the IM session for Sunday. It was apparent that the moderator's presence had to be established right at the beginning particularly for an IM chat. Otherwise, the teens were just trading comments with no real substance. Sort of like an aimless discussion that led to nowhere (isn't that applicable to lots of things in real life?). In rememberance of Sept 11, log in for a 'live' chat based on the theme of "How much do we understand each other". Chat with people between 13 to 35 years of age from Sugar Grove Public Library (Chicago, Illinois USA) and Jurong Regional & Tampines Regional libraries in Singapore. Some people might ask, "Why are libraries involved in Sept 11? Why talk about Sept 11 at all? My short answer is: "It's about Community, not Geography"
For a longer answer... I'll post it separately. 1. What is Instant Messaging? (IM) - a text-based computer conference over the Internet between two or more people who must be online at the same time. When you send an IM the receiver is instantly notified that she/he has a message. 2. How do I Instant Message? We are using Microsoft's MSN Messenger and Yahoo! for this event. Participants would have to download and install your own Instant Messaging (IM) program. Open a new message and type the library's IM name in the To: field OR add us to your buddy list, then double click on the library's IM name to open an IM window, and type your message. Join international action superstar Jackie Chan and acclaimed director Stanley Tong, in a discussion on Asian Cinema and more! Free admission but registration is needed. To register, please email us at asq@nlb.gov.sg. Registration ends on 8 Sep 2005. Please bring along the confirmation email from NLB for admission. Remember! Registration required, and ends 8 Sept 05. 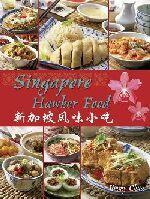 I wasn't sure if I should post this at all, 'cos Singaporeans who visit this blog might already know of the event. OK if you're local and you don't know this newsflash, drop me a comment so I'll know to highlight such stuff in future. To non-Singaporeans who might be reading this, Jackie Chan is the action movie star from Hong Kong. If you all notice the title of this post, I wrote "See" Jackie Chan, not "Meet" him. I bet it's going to be soooo packed that most people can only catch a glimpse of him. No, I don't think I'll be there. If anyone's blogging about it, drop a comment here. The Dartmouth College Libraries have put up a web-based manual on book repair (va ListNews.com). In the context of libraries, people talk about Preservation and Conservation work as two separate functions. Till today, I still have difficulties trying to differentiate between the two. Just when I think I get the difference between the two, I quickly get confused again because they seem so similar. I shan't even try to offer an explanation of how the two are different. Maybe you can make some sense of it from this article on Careers on Preservation Librarianship didn't really help. Think I'll stick to Public Librarianship. Conducted two sessions (2 hours each) with Rajen today: one in the morning, and the other in the afternoon. 2 hours per session may not seem like much but phew -- it's tiring to be a trainer. I appreciate the work that Rajen does even more. Not to mention the many teachers in schools. Salute! There seemed to be one grouse from the participants of both sessions -- too little time! They wanted to know more, but we couldn't, given the time constraints. You know, most people tend to be polite when you ask them to complete the feedback forms after the course, or when you ask them how it went for them. I usually take the positive comments with a pinch of salt and pay more attention to the not-so-positive ones. We were pleasantly surprised that quite a number of feedback forms had fairly detailed comments on what they found useful; what they had learnt. It's clear that most participants started with the perception that blogs were "frivolous musings of teenagers with too much time on their hands". So we showed them what else blogs were good for. I got a kicked out of the look on their faces when Rajen told them, "See, it's not just for teenagers. You people are now blogging. You're a blogger too." Whether they actually want to blog after today isn't the point at all. There might be one or two who continue to be skeptics. But at least majority can now make an informed decision for themselves the next time they read or hear something about blogging. Days like this, it feels good to be a librarian.